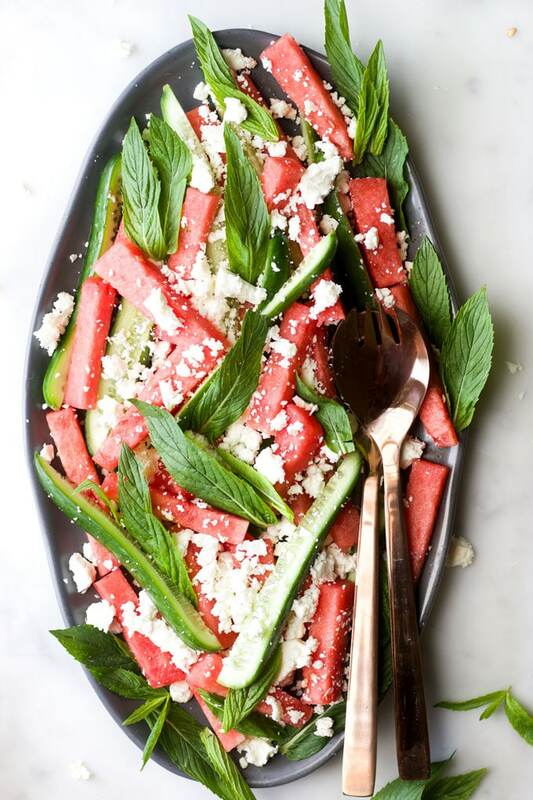 Watermelon Feta Mint Salad, a fresh and delicious salad with the perfect balance of sweet and salty. Early January is the time when most people are trying their hardest to get back into the swing of healthy eating after the festive period. When I lived in Scotland I found the easiest way to do this was to make pots of soup, crammed with veggies. 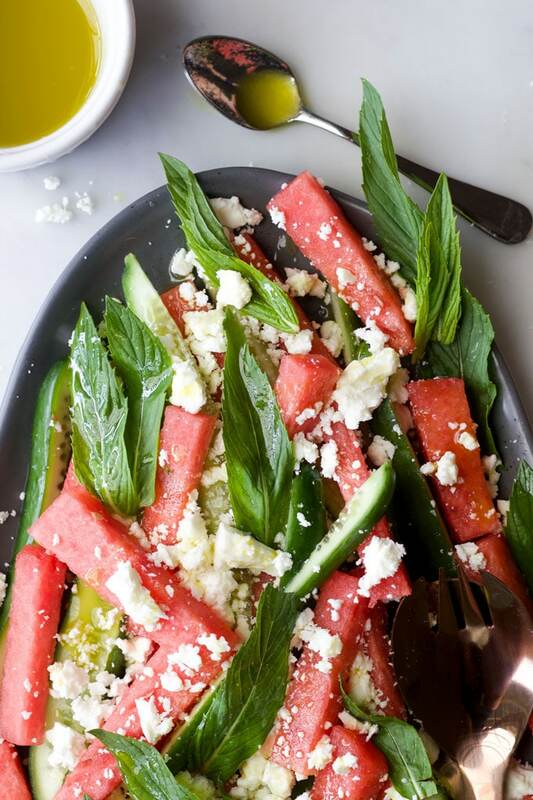 Now that I live in Australia it is all about the fresh salads and this Watermelon Feta Mint Salad is perfect for the hot weather we are having at the moment. Writing this post, I realised that I have never shared a salad recipe on this site before. This is despite the fact we eat them regularly. My salads are generally thrown together using whatever I have to hand and I rarely make the same one twice. 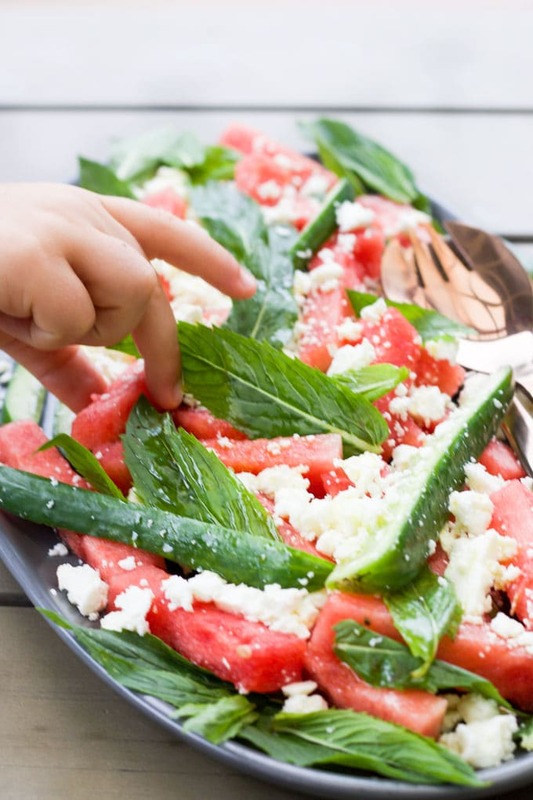 This Watermelon Feta Mint salad however, is something we have regularly. The kids love that it has both fruit and cheese in it and I love how fresh it tastes. 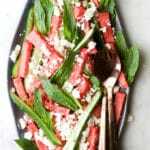 I often make this salad with small, cubed watermelon and cucumber pieces with finely chopped mint. It is delicious that way but lately I have preferred to serve it chunkier like the picture. The main reason is that my youngest can be picky when it comes to herbs and leaves. If everything is chopped small it is harder for him to avoid the parts he dislikes. If I keep the ingredients larger it is easier for him to see and pick out the parts that he loves (everything but the mint). I choose to do this rather than making a separate salad without the leaves. I want him to be exposed to food items that he doesn’t like on first presentation. It takes time and exposure for kids to grow to like certain foods. I never force him to eat the leaves but continually offer them to him. Having them on his plate for him to try, will hopefully result in him growing to love them. As watermelon is one of the main ingredients in this recipe, it is vital that you have a good one for this salad. When choosing, remember these top tips to pick a great watermelon. Pick the melon up, it should feel heavy for its size. This indicates that it is full of water and therefore fully ripe. Look at the colour, the skin should be dark green in colour and dull rather than shiny. Shiny skin can indicate that the watermelon in under ripe. Look for the yellow spot (field spot). The underside of the watermelon should have a creamy yellow spot from where it rested on the ground, ripening in the sun. The darker the spot the better. Don’t pick melon if it has a white field spot, or if the field spot is non existent. 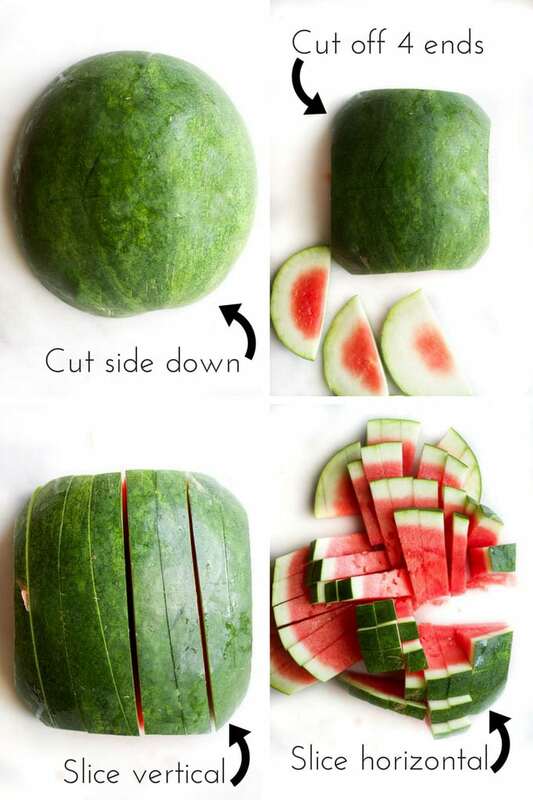 Tap the underside of the watermelon. A ripe watermelon will have a hollow sound, but a dull sound means it is under ripe. (People swear by this trick but I have never quite figured it out). Turn and slice again horizontally. The watermelon will fall apart into fingers. I like to use Persian cucumbers as I find them a great size. For this recipe, simply slice them in half, vertically and then again into quarters. Persian cucumbers have quite a thin skin, making them easy to chew and their mild, slightly sweet, taste works perfectly with the other ingredients in this salad. Their soft, yet firm texture also lends itself well to this salad. You can easily replace the Persian Cucumber with Continental / English Cucumber. They have similar properties but are longer in length. Qukes would also work really well. Look at the ingredient list. It should contain very few ingredients – sheeps milk, rennet and salt. Feta made with cows milk isn’t really Feta. It can be dry and crumbly and doesn’t have the same creamy texture. Look at the origin. Choose Greek Feta when ever possible and if you can’t find Greek Feta then at least make sure it is made from sheeps milk. I have use a simple lemon and olive oil dressing in this recipe, the kids love it and it complements the flavours of the salad. A balsamic dressing also tastes amazing with this salad. Have you tried this salad or any of my other recipes? I love seeing your creations – tag me on Instagram or Facebook. A refreshing salad with a perfect balance of sweetness from the watermelon, saltiness from the feta and freshness from the cucumber and mint. 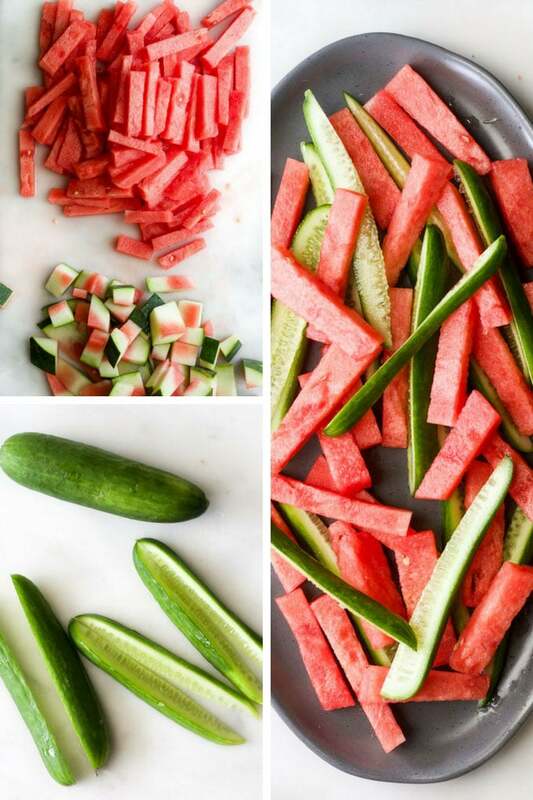 Arrange the watermelon and cucumber on a serving dish. Crumble the feta on top and then the mint leaves. To make the dressing squeeze the juice from the lemon into a small bowl, using your fingers to catch the pips. Add the oil and whisk until combined. Season to taste. Nutritional information is an ESTIMATE only, calculated using an online calculator. It should be used as a GUIDE only. Facts will vary with brands and produce. I love to order this salad at a restaurant, I’m not sure why I have never thought to make it for my kids before. Hi Ally, it is such a delicious combo isn’t it? I find this a really kid friendly salad as it has both fruit a cheese in it. Always a hit in our house!